Look anywhere online and you’ll see dozens of signs screaming at you to stop sitting on your laurels and get traveling. You get it. These signs are well-meaning for sure, and enough people love them. Personally, they’ve always made me want to vomit a little, but to each his own. Still, there’s a reason we see these signs everywhere, especially in the “travel writing community,” as we like to call ourselves. Every day travelers who blog, tweet, and write the equivalent of selfies in words detail the woes of having to work and only be able to travel a few weeks a year. Others describe their amazing travel experiences and complain about how they must get back to work eventually. Still others seem to have quite a bit of savings to sustain them throughout their extended worldwide trips. Hey, I wouldn’t complain! In all seriousness, however, not all of us are lucky enough to even have a choice. In 2013, I found myself in just that spot. I wasn’t allowed to travel this year due to my ridiculously poor health. While traveling overseas in 2012, I contracted what seemed to be just a prolonged fever. We son realized it was something much more serious, and it proceeded to trigger other diseases that have since taken over my body. I’ll spare you (most of) the details. Even if I wanted to travel, I couldn’t (and still can’t). I literally can’t predict how I’ll feel in the next 10 minutes—it’s that bad. Some days I’ve been able to function like a normal person, and other days I’ve had needles poked all over my arms and been barely able to walk or breathe. Not traveling hasn’t been a choice—it’s been an absolutely horrific jail sentence. My plight hardly compares to those who are permanently disabled, are suffering through terminal illnesses, or have any number of ailments or responsibilities more serious than mine. I realize even I am lucky compared to many other possibilities. Still, considering what an amazing year I had in 2012 (I worked, traveled, and volunteered from southern Europe to Nepal to Thailand, doing everything from writing a scuba diving guide to photographing and farming), being told by multiple doctors that I’m not allowed to travel in 2013 is nearly as soul-crushing as it gets. I hate writing such a serious post, but there’s no way to lie about how awful this year has been. Glossing over the bad parts (I have had at least three intense diseases in the past year, rendering me unable to walk, talk, or eat at times), it seems impossibly frustrating looking at my own photos of adventures in Asia, or chatting with friends over my next travel plans. Will there be a next? I’m not even sure. I’m currently on nearly a dozen pills a day and am too sick to plan anything. Yesterday I turned down a free cruise because I am a.) not allowed to travel, b.) don’t know how I’ll feel then, and c.) not allowed in the sun. Today is New Year’s Eve, and I’m feeling too ill to go out and see my friends. Not the greatest way to ring in 2014. I could go on with my ranting pity party all night, but perhaps a comparison chart would be more helpful. Let’s see what I did in 2012 versus 2013 to get a full grasp of the details. To be honest, 2013 has been the most difficult year of my life. Without health, you have nothing, and I have not had my health. On the other hand, I’ve been jacked up on so many medications that I didn’t catch a fever or cold all year! Yeah! For those who enjoy relaxing and watching movies and television, well, perhaps these illnesses would be a bit less terrible. But for me—someone who can barely sit still through anything, and who always craves action and spontaneous adventure—this year has been more than miserable; it’s been downright scary. I still don’t know if I’ll ever be able to travel again. Right now the doctors tell me I might be able to get back to feeling 90% one day. Still, there’s no point in making my readers pity me. I’ve got enough self-pity to go around! I’d never be able to explain what this feels like, so instead I’ll mention the few things I have done this year that you (probably) haven’t. 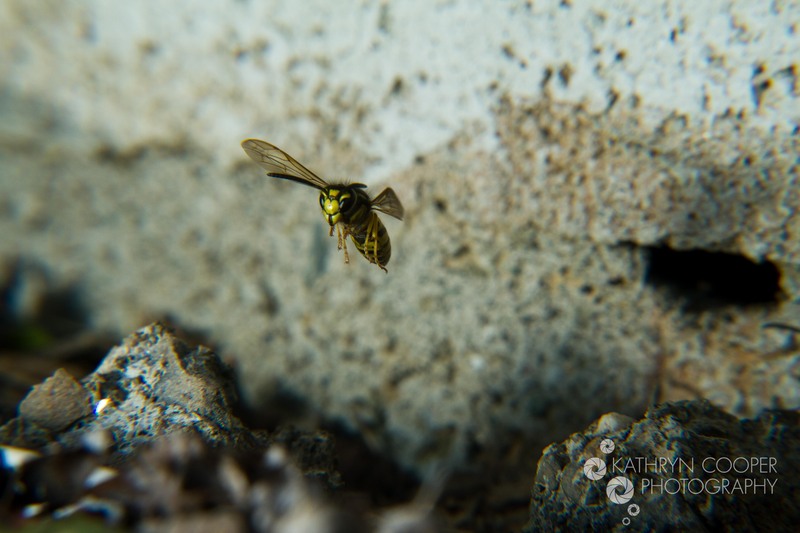 …got some awesome macro shots of these friendly bees outside my house. A bit too late, I realized they were not bees, and not friendly. Months later, I still have the sting marks. …saw Diana Nyad swim. Well, it was at a free charity event and not the actual event in Key West. Sorry. …refused more free civet coffee, because although it retails for around $50 a cup, I a.) hate coffee, and b.) don’t need to be reminded that a wild cat just pooped out the beans I just sipped. …schmoozed with chef Marc Murphy, because chef Marcus Samuelsson is so 2012. Just kidding. I ate for free at Marcus’ restaurant(s) and the food is pretty darn tasty. …participated in the world’s largest pillow fight. …realized I have an unhealthy obsession with free things. …admitted I did not just realize I have an unhealthy obsession with free things. …redid my photography website (www.KathrynCooperPhotography.com). I’m actually quite pleased! …got to walk the topmost rafters in Grand Central Terminal. Several times. 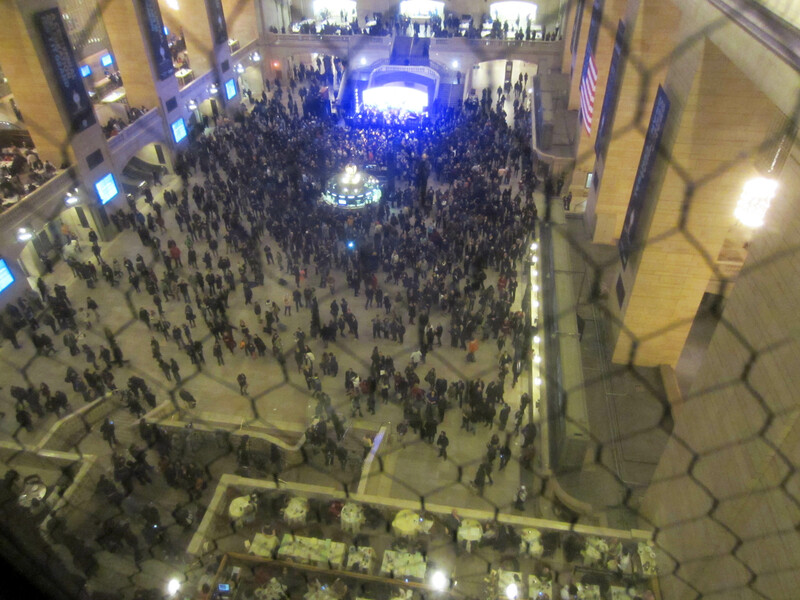 It was all part of a top-secret performance for the building 100th anniversary as performed but 135 of us involved with Improv Everywhere. See what we did below. Seriously, this one’s been on my wishlist for 15 years. Oh, and here’s the view from up there. This shot is from my little point-and-shoot and taken during the performance (small cameras were a necessary prop). I loved every minute of it! …tried both ice cream-flavored and candy corn-flavored Oreos. I regret both decisions immensely. As I’ve mentioned, it’s rather hard to keep up a travel website when you’re not allowed to travel. I hope that will soon change, because my eagerness to get out, be healthy, and explore remote areas of our globe is stronger than it’s ever been. I sincerely hope that those who have the chance to do something new and exciting—whether that’s traveling, going back to school, learning to surf and not getting eaten by a shark, or whatever floats your boat—take it. Seriously, be thankful for every day of good health you have, because you don’t know if or when it will get taken away. Here’s to 2014. Let’s hope it’s a heck of a lot better than last year! This entry was tagged Anti Tourist Traveler, Grand Central Lights, Improv Everywhere, Kathryn Cooper, Kathryn Cooper photography, travel and illness, traveling while sick. Bookmark the permalink.